Here's a link to Tony Fitzpatrick's Blog, called No.9. Tony is one of my favourite contemporary American artists and we got to meet him when we were travelling around USA in 2008. He has a studio in Buckstown in Chicago, where I couldn't resist buying a small etching from him. He also very kindly gave us copies of his three-volume set, The Wonder. He's an amazing guy - an artistic polyglot, as he's a poet, writer (his blog posts are amazing reads), artist, social commentator and, in the past, hes been a boxer. I'll put a link to his blog on my side panel to the right under ephemera. 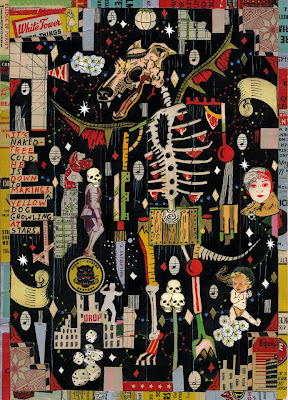 Tony Fitzpatrick, The Dog of Winter (for 10 Bears), collage, mixed media.